I ate way too corn chips today. The majority of the time I eat healthy, but I bought my husband chips to eat during the super bowl and it was downhill from there. It also reminded me why I normally cook everything from scratch. The chips have sat heavy in my stomach all evening. To make up for the over eating of chips I ate leftovers for the last two days. I love utilizing leftovers, it is a great way to save money and I try to change the dish slightly when I re-heat it so my family accepts it happily. Chicken and pasta recipes are my two favorite type of leftovers. They re-heat well and can be adjusted slightly to make new meals. Last week I tried a new recipe for Vinegar Braised Chicken and Onions from the February 2013 issue of Bon Appetit magazine. This recipe has 10 ingredients. It takes an hour and 20 minutes, 40 minutes of which is active and makes 6 servings. Finding fresh pearl onions in my area is always a task. They are only available in 6 ounce packages, which are overpriced. Given the price I bought only 18 ounces not the 2 pounds suggest by the recipe. Additionally pancetta in my area comes pre-cubed in 4 ounce packages, so that is the manner I bought them. As I almost always do I made my own chicken stock. This allows me to control the amount of sodium and ensure that it is gluten free. Finally, to thicken up the sauce at the end I added a small amount of cornstarch. Without the cornstarch the sauce was thin and greasy. I skimmed the fat and then added approximately a tablespoon of water mixed with a tablespoon of water. This allowed the sauce to thicken nicely and was perfect served with rice. I followed the remainder of the recipe as written. The sauce on this chicken was delicious. It was a nice combination of sweet from the vinegars and savory from the onions. The chicken turned out tender and cooked perfectly. The sauce when served over rice worked well and would make a nice pasta sauce as well. The combination of vinegars was perfect and is something I will try again in the future with other dishes and meats. 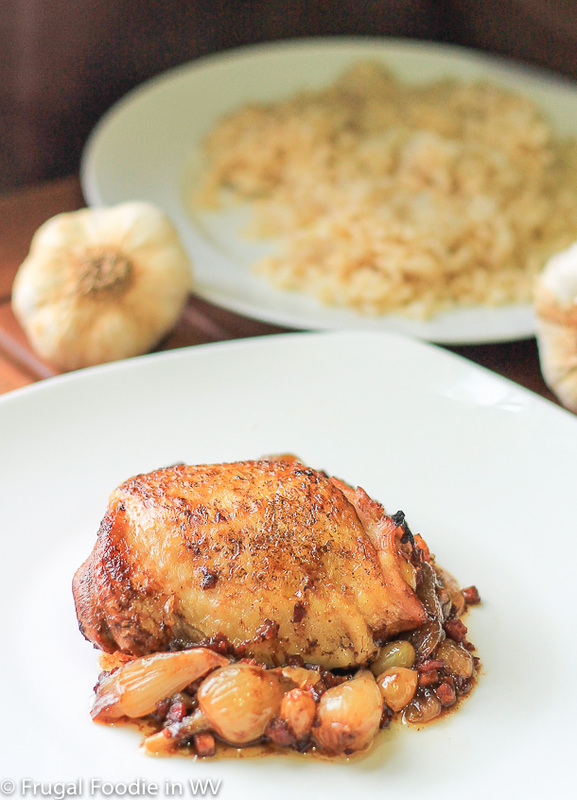 For the recipe go to Vinegar Braised Chicken and Onions. Thanks :) Glad that I could help! This looks so yummy! Thanks for linking this up with the MMM! This looks so good! I'm the same as you - put chips in front of me and it's all over! I've really enjoyed browsing through your blog ... you have some incredible recipes you've made. Thanks so much for your visit to my blog. It's great connecting through Bloggy Moms. Thanks for the sweet comments, come back again soon! The only thing I've ever used pearl onions in is my beef stew - this sounds like another great option for them, though!! Pearl onions are great in recipes, I love them! Mmmm, this would be delicious after a night of just corn chips. I would need something hearty and healthy too! Chips have always been my nemesis. I'm quite addicted and cannot have them in the house. Visiting from the Mom's Mingle. Now following via GFC Twitter and Instagram. Would love a return visit? Followed you back :) Come visit again soon! Sweet & savory is just my speed. Thanks for sharing! I love sweet and savory too, it's a yummy combination! Hello, this dish looks amazing. I like to try to bring new life to my left-overs, just so I don't get that crazy look from my family. I also believe that most pasta dishes taste better after a day or two anyways. I am your newest GFC follower, and found via 'Nice To Meet You Blog Hop'. I hope you have a wonderful day. That looks sooooo amazing.... Yum! Wow, that looks so good......Thank you for sharing with the Clever Chicks Blog Hop this week; I hope you’ll join us again!